I am pleased with this. It is a large sand timer. It takes exactly five minutes for blue sand to flow from the top bulb to the bottom one. It is designed for use with special needs children, to give them an idea of how long they must spend on task, but I think it will do equally well in our local writers' group. Our rule is that pieces should take no longer than five minutes to read out, which as chair, I am supposed to monitor. But I find it very hard to make sure everyone sticks to this. My awareness of time is not good, and I have a tendency to become so engrossed listening to other people's pieces, that at the end of some of them I can't believe that so much time has passed. 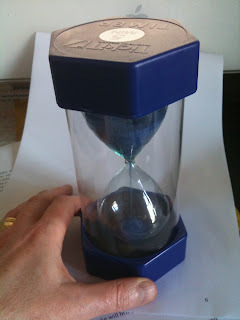 So I am hoping to do better with the aid of this timer. There is something hypnotically zen about watching sand flow away. I imagine my mind emptying with the sand, and then, for maybe five minutes more, contemplate the place where the sand had once been - and then, soon, will flow to again. Authors North Meeting in Hull, 26th March. A Talk at Oriel, Llangefni, Anglesey.